Of all the stress fractures that can occur in the lower extremities of athletes, one of the least common, but unfortunately most serious, is a navicular stress fracture. This is a bone in the midfoot toward the inside of the foot. Stress fractures of the navicular occur in running and jumping athletes, such as basketball players. As with most stress fractures, the athlete will notice pain in the foot despite not having an initial injury to initiate the symptoms. Often the pain will come on after a certain amount of activity and will go away with rest. As it progresses, the pain comes earlier in the training session or game and takes longer to go away. Later on, the pain will not go away with rest and can bother the athlete with activities of daily living, such as walking. 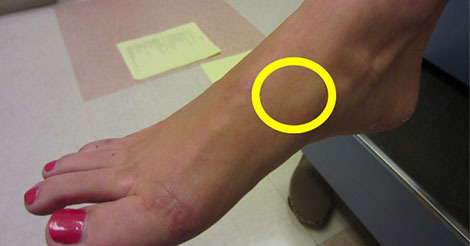 Sports medicine physicians who examine these athletes will note tenderness to palpation on the inside of the midfoot, but sometimes the pain can be somewhat diffuse. A high index of suspicion is needed to avoid missing this injury. Early on in the process x-rays can be negative, so a bone scan or MRI might be performed. Navicular stress fractures can be serious injuries. As with most stress fractures of other parts of the body, treatment is often nonsurgical. Unlike most stress fractures, however, sports medicine physicians are usually very careful with this injury, and I almost always place these athletes in a cast. I’m very concerned with the possibility of the fracture not healing, so I will even keep the athlete from putting weight on it until the fracture heals. Many surgeons even advocate surgical treatment, especially in high-level athletes. If the fracture does not heal, surgery to put bone graft in the fracture and hold it in place with one or two screws is indicated. Navicular Stress fractures and heel pain. This injury, whether treated surgically or non-surgically, often costs the athlete the majority, if not all, of the season. Most surgeons recommend that the fracture completely heals prior to resuming any type of running. Running and then sport-specific activity is instituted slowly, and the process can take up to 4 to 6 months.